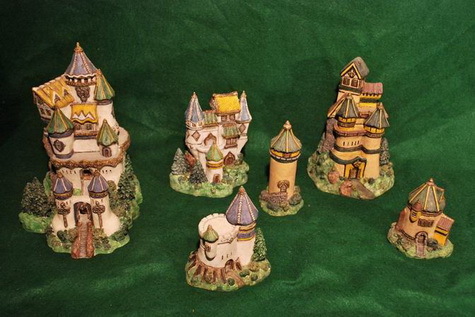 Candora Castles – "Fine sculpture for every environment"
The long awaited Candora Castles are here! We currently have about 8 of the Sylvanwood collection (elves, Fairies & noble woodland folk), and 8 Shadowmire (goblins, vampires & shadowlings). But there will be Many more to come. We have over 150 on the shelf awaiting molds. They are cast out of a durable, light weight resin/hydrostone formula and they are impeccably detailed and painted. We should have the Candor website up soon, but for now visit our Candora Castleworks facebook page for more information and photos. https//www.facebook.com/candoracastleworks or call us at 970-461-8297 to order.